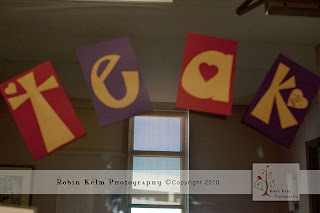 Teak had his own room with his name on the door! Those NICU nurses are angels!! Teak with his feeding tube in and his IV in his hand. Sleeping soundly. Mama and Daddy checking their boy out! 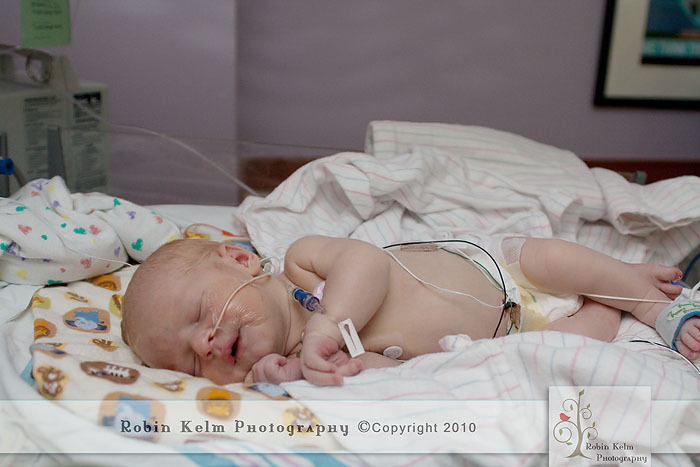 Finally, I have decided to post the pictures of Teak when he was in the NICU. Words truly cannot explain why I didn't want to post them. Maybe it was just all too personal. This was my reality with my first born, my son. It is weird how people want to see a baby in the NICU. So many friends and family wanted to come visit him in there which we appreciated however I was hesitant about people visiting as well as posting a picture of my "injured" baby boy on social media or passing it around emails. Now, looking back, I was a little overprotective and not really seeing the good in people who wanted to meet our new family addition. Deep down I believe it was about keeping something for myself and Chad. 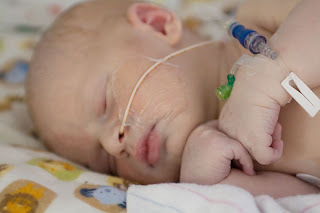 So many things were out of our control with Teak's birth, surgery, and life, that by keeping him sheltered as much as possible from other people seemed to be something we could keep as our own. Our private time to bond with our special child. 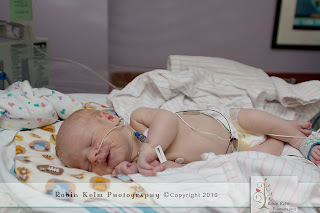 Even with all the tubes and wires hanging from his body, he is so beautiful and miraculous! 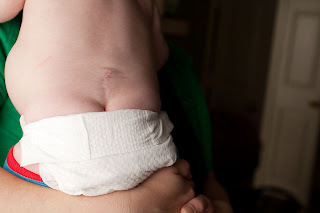 Here are pictures of his warrior wounds so that you can get an idea of what Spina Bifida Myelomenigocele can look like. We were told Teak's lesion was more of a thicker, partially skin covered sac that contained his spinal cord and nerves. Now, you can see where the skin starts and the membrane begins, in my opinion, but either way the membrane was much thicker than what we had seen on other SB babies backs. The wonderful pediatric neurosurgeon, Dr. George, stated that his spinal cord was in-tact and there was not a whole lot of tethering and nerve damage. 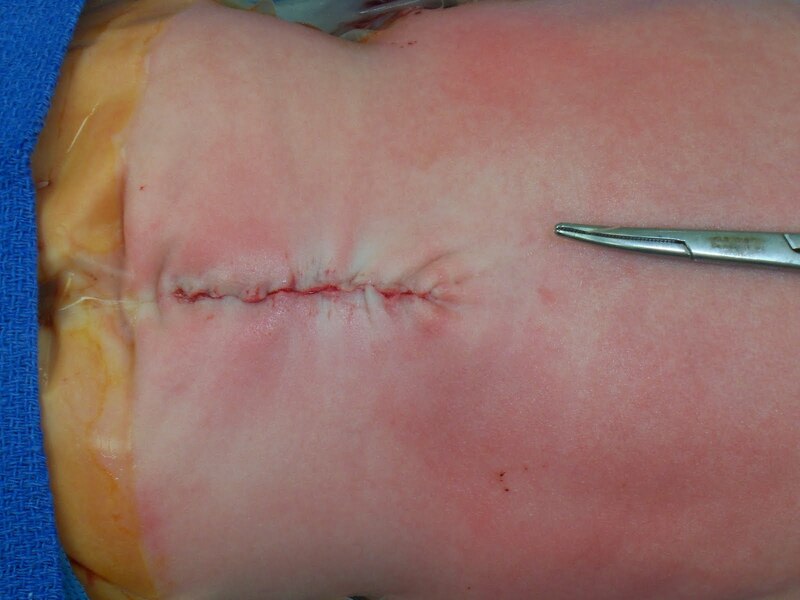 Now, not all sacs are like Teak's sometimes the cord and nerves are not in a sac, they are exposed to the amniotic fluid. Sometimes the sac looks similar to a jellyfish, very thin and red. All cases are different. The last picture is showing his back all healed up when he was almost 5 months and looking really good, the scar is even white in color. Children are so resilient. They heal so quickly, at least quicker than I would have expected. The red mark around the scar will always be there, may get a little lighter with age, but a nurse practitioner told me it was more of a birth mark now. God truly had a hand in every aspect of Teak's Spina Bifida story. 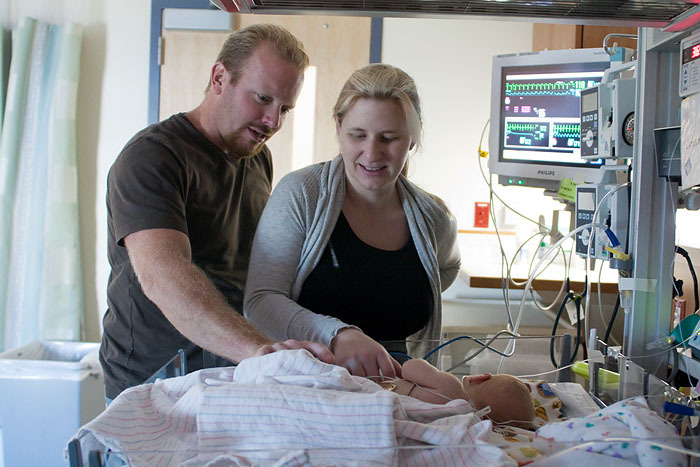 As soon as we found out, we started praying for strength with us and healing for our son. I always seem to have hesitation in saying that because of all the other people and children who have SB or any other disabilities or diseases who do not have great outcomes or lose their lives. God didn't take SB away from my child. Teak will always have Spina Bifida and his hearing loss, however, our hearts were calmed, our needs were taken care of, and our hands were held as we held each other through the hardest time of our lives. And it was all Jehovah-Jireh - the God who provides. Teak's scar at 5 months old.